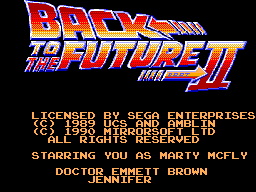 The storyline is the same as the film,you play as Marty Mcfly and have to guide him through time into the future and past to assure a safe future. The game is split in to five levels,level 1 and 5 you are on a hover board dodging various obstacles,level 2 and 4 are bonus/puzzle type levels and level 3 is a vigilante walking/punching style of level. 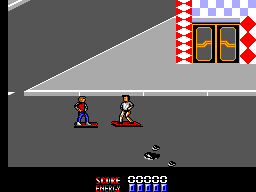 The gameplay to this game is awful,the main gameplay is the hoverboard levels where it can get frustrating very quickly.Trying to attack an opponent is almost impossible and jumping over an oncoming enemy at 100mph can prove to difficult.The hover board handles like a shopping trolley and is sometimes too slow or even sometimes too fast.Level 2 is an overhead view of a house where you have to guide a person out of a house without being caught and level 4 is a puzzler in which you have to rearrange a picture.These two levels are totally pointless because you don't even have to complete them to progress to the next level.Level 3 is a short, easy walk and punch stage which takes no more than 2 minutes to get through. The graphics for the characters are small with not much detail and when there's a bit of action on screen things tend to flicker or disappear alltogether. The backgrounds are very bland but they have tried to make them 3D in the hoverboard levels. The sound effects are not too clever and as for the music....ouch my ears. 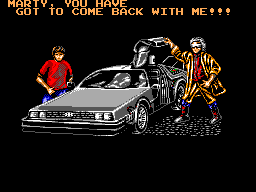 The music on the first level is supposed to be the theme music for BTTF and it sounds totally out of tune,it really is some of the worst music ever heard on the SMS. The controls were laid out OK mainly because there's so few moves to perform in the first place.However that hoverboard can be extremely awkward to control,trying to jump over an opponent is also hard at times especially when you don't even need to be close to be knocked off. The game can be challenging but after a few goes I doubt you'll ever return to it.This game has no appeal what so ever. The game is horrible to play and on top of that the music on the first level could give you a major headache,with two of the levels being totally pointless and one level being very short it leaves you with two annoying and at times frustrating hoverboard levels which have no fun in them at all. Overall this has to be one of the worse SMS games of all time,come back Alf all is forgiven.